I just returned from another fantastic trip to Nepal. This time of year the sky is blue and the Himalayas peek over the foothills. It’s a bit chilly and the air pollution was the worst I’ve seen in 15 or so trips there. Thick dust and diesel soot really clogged me up. It’s taking awhile to recover. Dinesh, our colleague in Kathmandu, was often my taxi as I rode on the back of his scooter through the soup of smog. I used to ride a motorcycle a lot in Nepal, but I’m trying to cut back a bit. The politics are still in turmoil, and the city seemed even dirtier than usual. There’s still a lot of rebuilding going on from the earthquake. There was one huge life changing improvement – the electricity works. The load shedding of electricity has ended and was apparently caused by corruption and waste in certain factories. This is a big deal because lack of electricity really brought the basic functions of the economy to a slow pace. Hopefully the electricity supply will last. There were so many highlights and rewards on this trip. Our Hopeful Home orphanage children are happy, healthy and studying hard. I visited their school and the principal is very pleased with the kids. Many of them are leaders in their school classes. Thanks to a special donation they are warmer and better equipped for school. 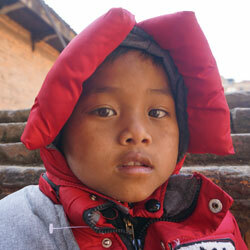 We bought them all new winter clothing and school supplies at the bazaar near their home in Bhaktapur. We were also able to get two new computers for the children, again from a special donation. Santosh in his new winter jacket. I spent a night at the orphanage this time and a dance party broke out. Even 5 year old Santosh danced. Santosh is from the Chepang caste and Chepang speak a different language than Nepali. Santosh is learning Nepali quickly, but I’m not. The food was great and the cooks are sweet ladies who work hard to care for all the needs of the kids beyond their food. Gopini, the founder, is consistently caring for the children also. At dinner time I sat by Santosh who ate a mountain of rice, at least twice what I could manage. The children have routines and are so well behaved and respectful. It’s amazing how nicely adjusted they are. Several of them have very disturbing pasts but are doing so great. The oldest boy, Krishna, is now in college. I have watched him grow up for many years. He’s an engaging young man with a bright future. He speaks English fluently and tutors the younger children. 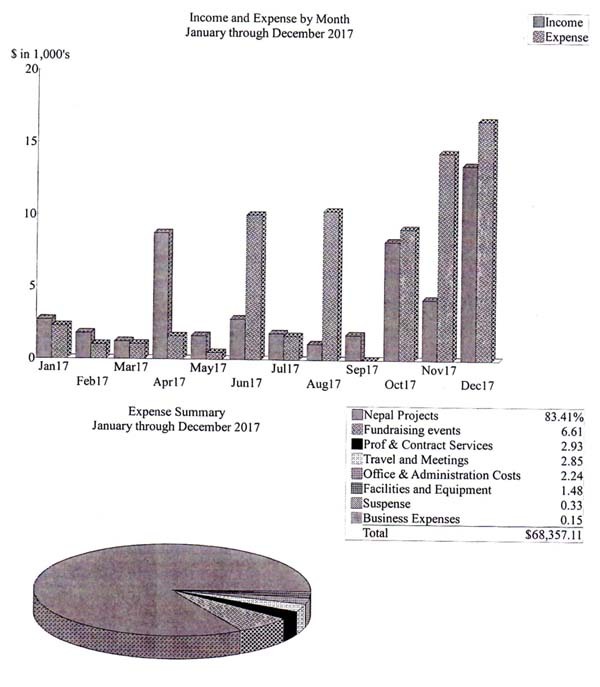 The expenses for each child for one year are around $1000. If you would like to personally sponsor one of these children please let us know! The children love guests and volunteers, so if you’re ever in Nepal let me know. I visited the Himalayan Education Center (HEC) hostel in Khandbari, Nepal. The girls are doing really well. They are serious about their studies and they are really funny and enjoyable to be around! They laugh at my attempts to speak Nepali and pay great attention to making sure I’m absolutely stuffed with food and tea. They are quite attentive to guests and it’s an interesting experience visiting a home full of girls from diverse castes and mountain villages, being the only foreigner in the area. I always see or learn something new. One night, at 2am, a bizarre noise came from outside the hostel. It sounded like a dying goose might sound, I guess. It got louder and real close, just outside my door. I went outside to find a man wandering around the perimeter of the hostel blowing on something like a ram’s horn. As the house is full of young girls, and I thought he was a crazy man or a drunken suitor, I grabbed a stick and confronted him. He said something to me I didn’t understand then turned around and walked away quickly. In the morning I learned that he was a Jogi, which apparently is a people or caste who traditionally wander around homes in the middle of the night blowing their horn and casting off bad luck or evil spirits. They then come to the homes the next day to ask for donations or offerings for this service. So the Jogi came the next morning for his donation. He was looking a little uneasy and asked the girls about the man who confronted him in the night. I apologized for not knowing his intentions and we all shared a laugh. The Jogi laughed the hardest. Sunita gave him a donation and off he went. I learned about Jogis this time in Nepal. It’s the dry season, so when water occasionally runs to the house, the girls scramble to get buckets and tanks filled. They can collect water at a local tap also which is crowded with people trying to do their dishes, shower, etc. The sources are surface water and I never drink it without adding iodine or boiling, but the girls have no choice. They would burn too much gas boiling it all. During my visit I installed an Aguaguard water filter at the hostel. It will remove parasites and other impurities in their drinking water. It works really well and I was very pleased. For gifts Sunita and I got the girls circular needlework frames. They were fascinated with them and immediately began making gorgeous creations in their free time. The HEC girls are tutored by a local teacher at 5am in the morning before school each day. There are 10 girls living at the hostel right now. One girl was back in her village awaiting her exam results before continuing her education. In Nepal it often takes up to 6 months to get exam results. One girl recently left to provide care for a sick relative in her village. One girl had recently left to continue her education in Kathmandu. Sunita will select 2 or 3 new girls before the start of the school session in the spring. 13 girls have graduated and are teaching after being at the HEC! The HEC hostel requires $1000 per girl per year to support which includes living expenses and school expenses. It’s a great deal to change a life. If you would like to sponsor one of the girls please let us know. Sunita and I initiated a new library in Sekaha, Nepal. This library is dedicated to a special person who helps us with our fundraising. A new library is always an opportunity for a celebration at the school. It’s usually a vibrantly colorful program with dancing, many speeches, flowers, and songs. I always explain that I’m not the donor who gave the money for the library and explain who that really is. I am kind of a lucky middle man. And I feel fortunate to be away from fundraising and other mundane tasks doing real things that help people in a gorgeous country with a rich culture. They will really enjoy the books and their knowledge. Sunita made some great book picks based on their requests. 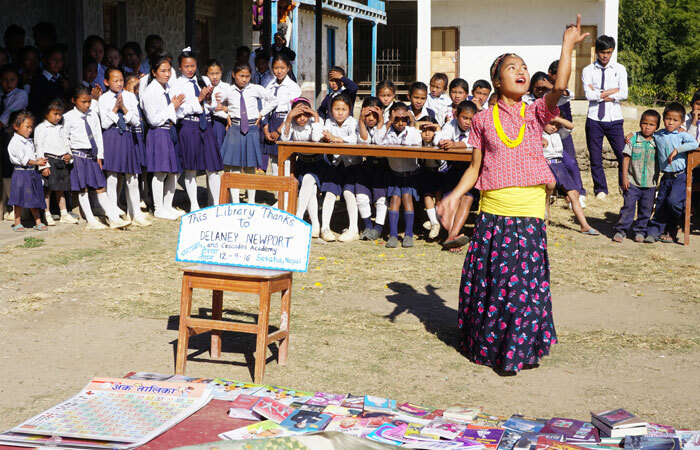 We have now created 22 libraries in villages in Nepal.